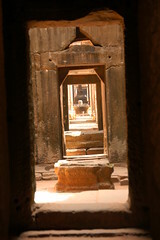 Somehow my Cambodia photos never got posted to my blog. So here they are now, from our trip way back in March 2007. Still good times. Amazing ancient temples, contemplating the economics of their massive construction, miles of miles and millions of man hours of resources on seemingly pointless though remarkable and amazing construction. Though of course, Civilization II taught me the true purpose of Temples, it keeps your citizens content, which is a necessary pre-condition to keep large groups of people amassed in one place from killing each other, thus reaping the benefits of Adam Smith style specialization that comes from civilization. The economist, Iannancone formalizes this more academically. It was amazing being in such an economy where professionally cute children could earn an adult's daily wage (a few US dollars) from a sympathetic tourist. Where we could hire a personal car and driver for less than the price of a rental car anywhere else. We got to play Indiana Jones, exploring the ruins of Angkor Wat. Especially when we got our driver to take us off the beaten path, to Beng Melea, which unlike the main temples has been unrestored. 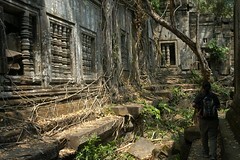 This was where they filmed Tomb Raider, and we had the entire complex, whose proud walls were being digested by the forest, mostly to ourselves. The ruins with the collapsed walkways and mountains of rubble and giant roots were difficult to navigate, but the abundant and friendly local guides were eager to show us the way, though R- and I enjoyed the process of getting lost amidst the ruins as well.